Mosul, one of Iraq’s largest cities, is slowly rebuilding its healthcare infrastructure after years of war. Dr. Henryk Pich is doing his part to help. As a young man, Dr. Henryk Pich spent time travelling in the Middle East. Not surprisingly, he feels a personal connection to the region and, after seeing the devastation caused by years of war to cities such as Mosul, wanted to offer whatever help he could. Moved by the makeshift treatment centers he witnessed in the hospital ruins, he promised the skeleton team of local doctors at the pediatric hospital that he would return, bringing with him much needed equipment, and training resources. Now a consultant anesthetist and intensive care physician at the University of Dresden in Germany, Dr. Pich returned to the region soon after fighting had ended, supported by the Germany-based independent aid organization CADUS, which builds mobile medical clinics for areas with significant need. Once the fighting had ended, Dr. Pich joined a highly skilled, inter-disciplinary team of paramedics, nurses, doctors, technicians, and project managers working in Mosul. His first trip with the organization centered on a refugee camp outside of Mosul providing primary healthcare to the hundreds of thousands of refugees displaced from their homes, from where the team visited the specialist women and children’s teaching hospital in Mosul, the Al Khansaa Hospital. The experience formed a lasting impact on Dr. Pich. Dr Pich is passionate about ultrasound, particularly in the specialties of regional anaesthesia and emergency medicine, and uses his skills to educate others whenever possible. With the ultrasound system arranged, Dr Pich had clear objectives for his next visit – to hand over the machine and, alongside an Arabic translator, deliver a training course in regional anaesthesia and emergency ultrasound. Dr Pich continues to be involved with CADUS and is now working with them to plan ongoing support for Al Khansaa in the future: “It is very important for us to keep the connection with our colleagues in Mosul, not only to encourage more donations but also to transfer knowledge and skills. 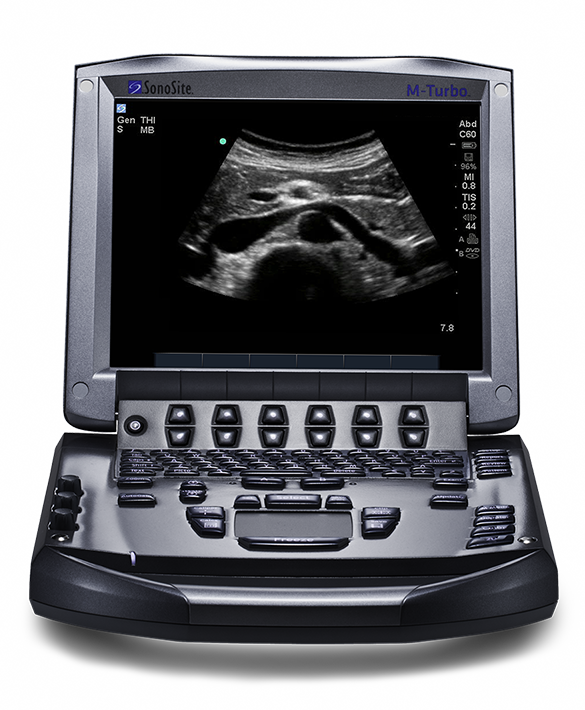 I am very grateful to SonoSite for its generosity and think the M-Turbo was just the right piece of equipment they needed. I felt a large sense of responsibility transporting this valuable machine to a war-stricken country, for people who really needed it, but I am very pleased with what we were able to accomplish. The SonoSite M-Turbo ultrasound system gives you striking image quality with sharp contrast resolution and clear tissue delineation.